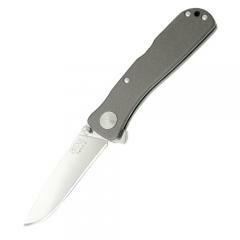 Lightweight, versatile and tactical the Twitch II Plain Edge folding knife is perfect for everyday carry (EDC) and use. The blade is forged from AUS-8 steel, delivering an all-utility tool that is guaranteed to hold an edge. A specialized speed-opening system allows users to deploy the knife's blade with a quick tap of the finger. The anodized aluminum handle is lightweight without compromising the strength needed to withstand extreme conditions of tactical use. Once open, the ergonomic handle fits naturally in the hand for a secure and comfortable grip. An integrated front finger loop offers additional retention strength for superior handling and ultimate control.